Social Media Posts & Company Reviews. 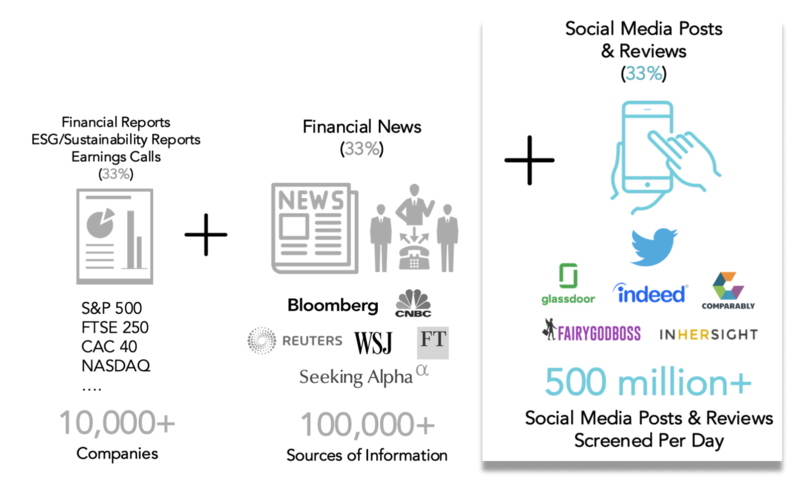 The Sensefolio system screens and analyses 500 million+ social media posts and reviews every day. Our algorithms are run every hour to guarantee a near real-time company monitoring. How is Twitter integrated into the Sensefolio scores? The Sensefolio algorithm is taking into account social media posts on Twitter (i.e. ‘tweets’). These latter can be from the companies themselves or individuals. With its strong database listing all of the hashtags (i.e. 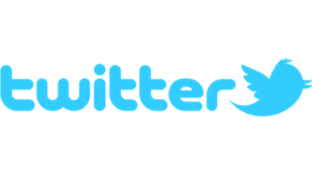 the ‘#’ character) associated to ESG and sustainability topics, Sensefolio analyses and ranks Twitter posts depending on the Sensefolio ESG Classification Standard. Sensefolio holds also a database listing all the companies’ Twitter accounts and their affiliated ones; meaning the final grade will aggregate all of the parent company’s tweets as well as its subsidiaries’ ones. Below are some examples of ‘tweets’ featuring ESG and/or sustainability-related topics. 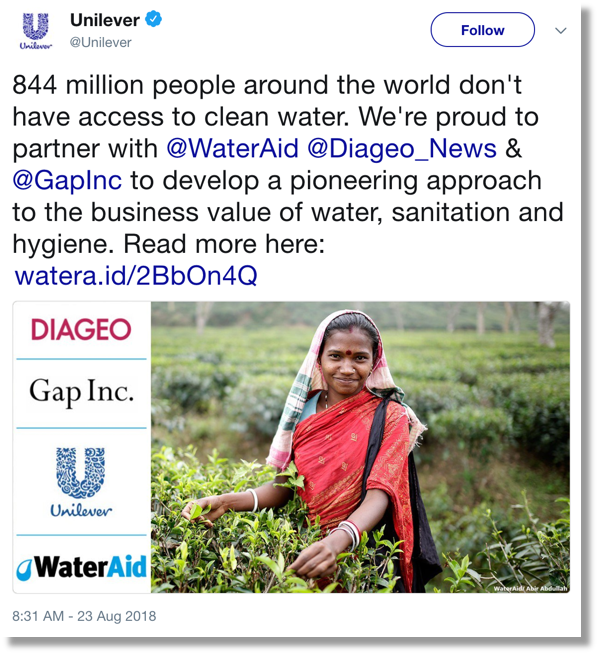 On Exhibit 4, Unilever asserts partnering with WaterAid, Diageo and Gap Inc to develop a “pioneering approach to the business value of water, sanitation and hygiene”. 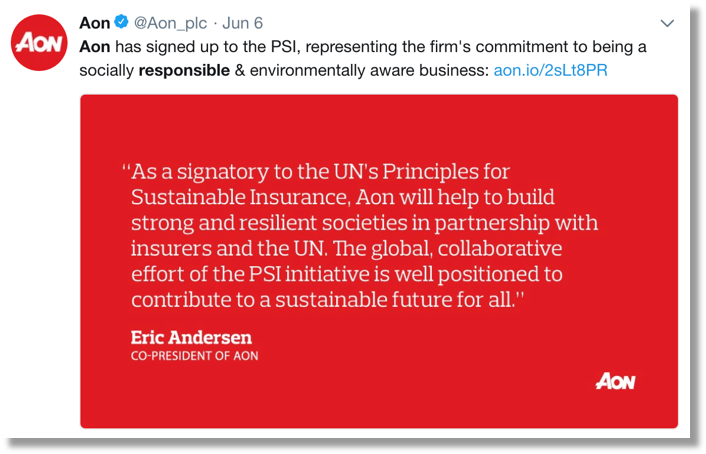 On Exhibit 5, Aon declares signing up to the UN Principles for Sustainable Insurance. 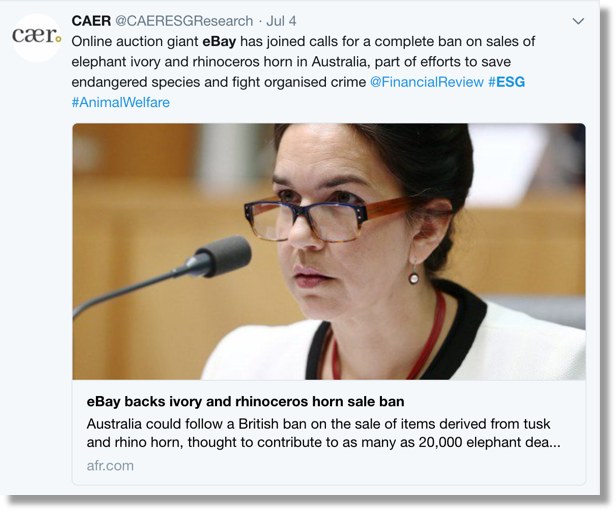 On Exhibit 6, this is an example of a non-listed company’s tweet declaring that eBay backs ivory and rhinoceros horn sale ban. To assess the veracity of the post, the Sensefolio algorithm will not only screen the link attached to the post, but also look for at least one external news provider from the Sensefolio’s database of news vendors to support the statement. In this way, two major news providers confirm this is the case, adding to the veracity of the tweet’s source (see Exhibit 7 and 8). Sensefolio analyzes more than 500 million tweets per day. Note: Posting various ESG-related tweets does not guarantee their originators (the companies) to be highly ranked according to the Sensefolio ESG Classification Standard. Indeed, posts are deeply monitored, assessed and subject to verification with external financial news and their degrees of subjectivity. 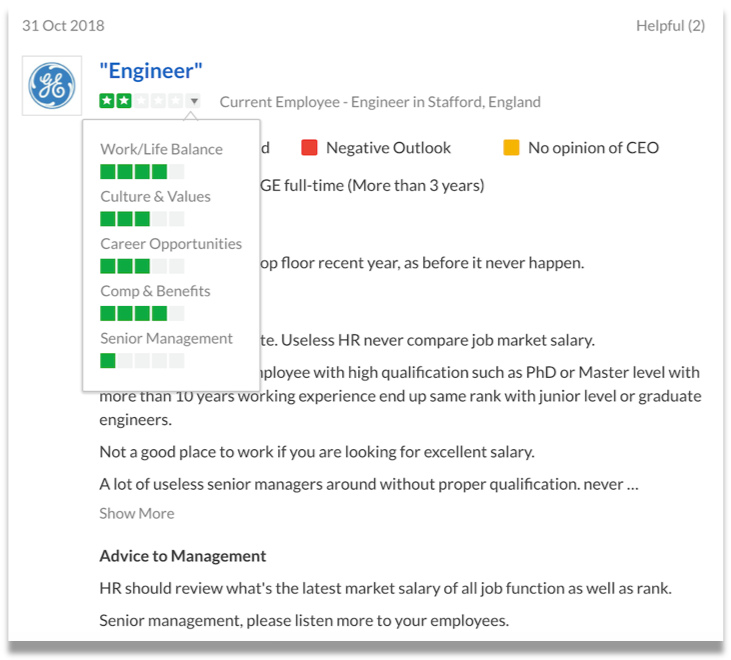 How is Glassdoor integrated into Sensefolio scores? 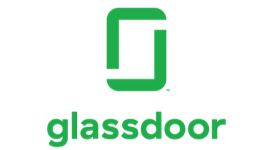 Glassdoor is a website where employees and former employees anonymously review companies and their management. As of today, 800,000+ companies and their reviews are available. Thus, every company covered by Sensefolio are present and available on Glassdoor. Note that the full history of reviews and grades assigned to companies have been retrieved by Sensefolio in order for us to track the evolution of the grades and whether the company has improved, is improving or will improved its structure, workplace and governance. 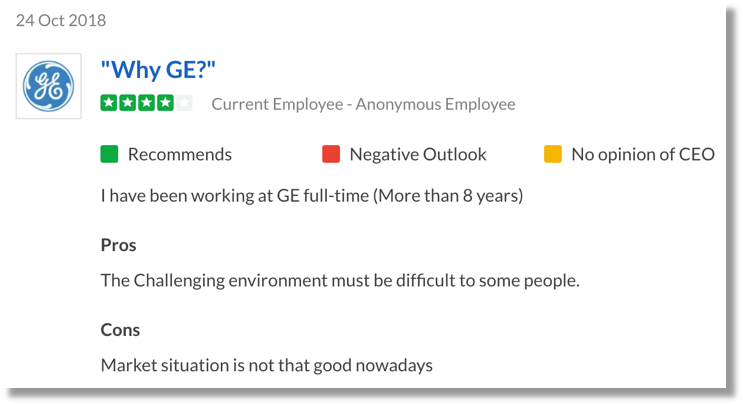 Sensefolio analyzes more than 40,000 reviews per day on Glassdoor.com. Note: We, at Sensefolio, consider company reviews from former and current employees as highly significant in the prospects and culture assessment of the company and its structure. We believe bad reviews will impact the company performance negatively, while good reviews will have a positive impact on the company performance. How are Indeed.com company reviews integrated into Sensefolio scores? Indeed.com is a worldwide employment-related search engine for job listings launched in November 2004. In 2010, Indeed.com passed Monster.com to become the highest-traffic job website in the United States. Indeed.com also features millions of reviews from current and past employees. As of today, 72 million company ratings and reviews and their reviews are available. Thus, every company covered by Sensefolio are present and available on Indeed.com. Sensefolio analyzes more than 30,000 reviews per day on Indeed.com. How are Comparably.com Company Reviews integrated into Sensefolio scores? Comparably.com‘s mission is to make workplaces transparent and rewarding for both employees and employers. Comparably reveals company cultures & market compensation (as contributed by real employees), and showcases the fairest and accurate display of employer brands. As of today, every company covered by Sensefolio are present and available on Comparably.com. Sensefolio analyzes more than 10,000 reviews per day on Comparably.com. How are FairyGodBoss.com company reviews integrated into Sensefolio scores? FairyGodBoss.com offers a women’s career community, expert career advice, job openings and company reviews to help women advance their career. As of today, about 2/3 of companies covered by Sensefolio are present and available on FairyGodBoss.com. Sensefolio analyzes more than 10,000 reviews per day on FairyGodBoss.com. How are InHerSight.com company reviews integrated into Sensefolio scores? 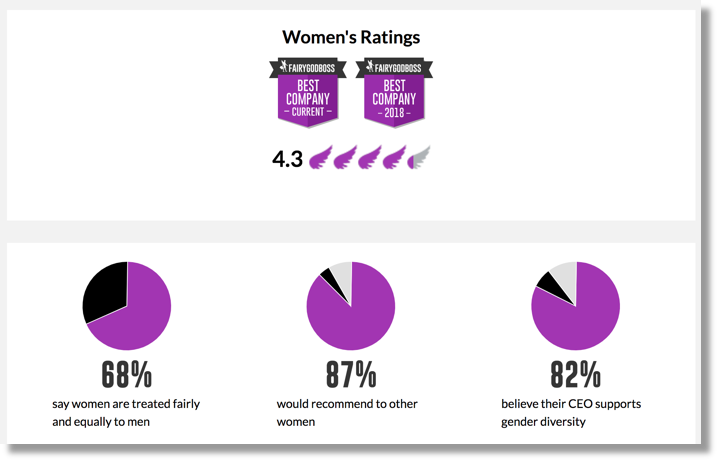 InHerSight.com helps women find workplaces where they can succeed using anonymous company ratings specifically for women. As of today, about 2/3 of companies covered by Sensefolio are present and available on InHerSight.com. Sensefolio analyzes more than 10,000 reviews per day on InHerSight.com. Note: We, at Sensefolio, consider company reviews from former and current employees as highly significant in the prospects and culture assessment of the company and its structure. You are one step away from browsing and start monitoring over 10,000 companies's ESG involvement with Sensefolio.